Something that's often lost in the modern-day cocktail frenzy are these certain categories or types of drinks where the base liquor isn't the potation's (love that word!) defining characteristic. Consider, for example, the very word cocktail; in its nascence, it had a rather strict interpretation, but what made it strict wasn't which type of liquor you used, but what else you put in the glass: A mixture of any liquor, sugar, water and bitters. Smashes, shrubs, fizzes, swizzles, slings, flips, rickeys, fixes -- I love this stuff! 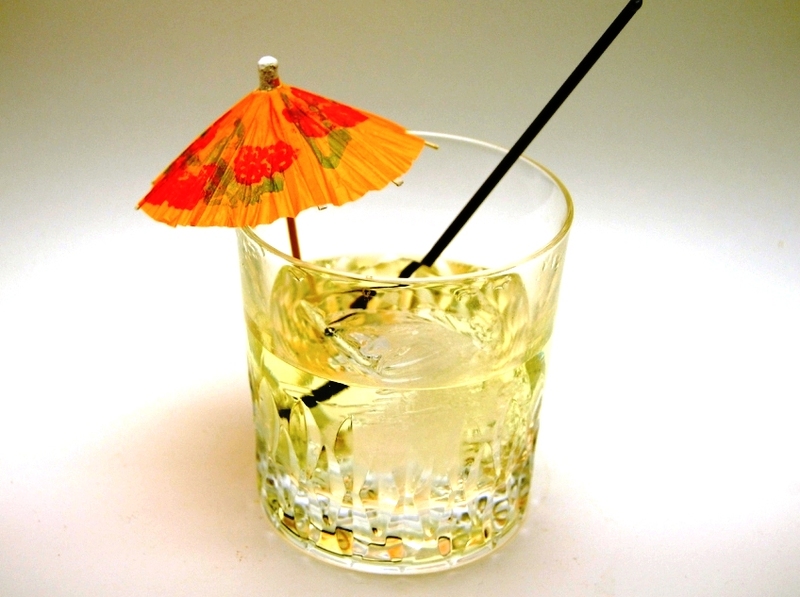 Today, we are going to talk about another Versatile Cocktail category/subgenre, the Stinger. A stinger is basically made by adding a half-ounce of white creme de menthe to a shot of liquor... I will wait a moment to allow for any unintended gag reflexes. I know it sounds bad, but really it's not! I've found recipes for a Brandy Stinger, a Tequila Stinger, a B&B Stinger, but today I want to share the one I like best, Stella's Stinger, which does things a little differently. In turn, I've done things a little differently from the recipe as I originally found it. Coat the insides of a highball glass with the Pernod. Fill glass with ice and combine all other ingredients into the glass. Stir briskly. Garnish with lemon twist (optional). The Espolon is a 100% agave tequila, if that means anything to you. It's got a very sweet and pleasant nose. I'm not sure how much I'd trust this recipe with rail tequila or Jose Cuervo. I reduced the white creme de menthe down from a teaspoon to a splash. I have a theory that the reason Stingers are no longer popular is that we as a drinking culture really don't care for creme de menthe anymore, and I didn't want the drink to taste overpowered. It's really good the way I wrote it, promise!